Book your hotel on time. Nice is a very busy city at this period. Mathez has been appointed as official housing bureau for E-MRS Spring Meeting 2019. Rooms have been secured from May 26 to 31 included. DUE TO THE MONACO FORMULA 1 GP, THE NIGHT OF MAY 26 IS NOT REFUNDABLE IN CASE OF CANCELLATION. With more than 80 years of experience, dealing with congresses, they can help you to take care of your needs regarding accommodation (negotiated rates and allotments), transfers, meeting rooms, dinners, tours, and hostesses. The European Materials Research Society (E-MRS) has been made aware of service providers of the name Exhibition Housing Services (EHS), Travelion or Expo Planners, which have contacted a number of participants, citing the Congress, to offer hotel reservation services. Please note that Exhibition Housing Services (EHS), Travelion or Expo Planners do not represent the European Materials Research Society (E-MRS) nor Nice Acropolis Convention Centre, nor E-MRS or Nice Acropolis Convention Centre have authorised them to use their names or trademarks on information they send out to participants. Extended deadline for abstract submission: January 21, 2019. Because major revisions may affect a symposium organizer’s decision to accept your abstract, please review it carefully before submission. In the unusual circumstance of having to revise your original abstract, the online submission center enables authors to revise their abstracts up to and including the submission deadline of January 21, 2019. After that date, the change must be submitted to: emrs@european-mrs.com (Subject: Abstract Revision) and must include your Control ID number. Please state exactly where the revisions are located (e.g., title, author, body, etc.). Authors will be notified of acceptance and mode of presentation by February 26, 2019 at the latest. Registration starts at the end of the abstract submission period only. Online registration will be possible until May 21, 5 pm (CET). If you do not have an E-MRS account on our website, you need to create one before registering to the Spring Meeting. Attendees can also register on-site at the Convention Center. On-site registration opens SUNDAY, May 26 at 15:00.
including: access to symposia, access to poster sessions, access to exhibition, access to workshops, conference booklet, lunches from Mon. to Thu., coffee breaks, social event, E-MRS membership for one year and one proceedings volume (if applicable). Does NOT include access to the tutorial on Thin-film synthesis from the vapor phase: fundamentals of processes, growth evolution, and applications. On-site registration opens Sunday May 26 at 15:00. On-site registration will be available for the duration of the meeting. IMPORTANT: On-site registration may not include any conference pack: bag, printed version of the conference program, … (depends on availability left). It includes only access to symposium rooms, lunches from Mon. to Thu., coffee breaks and social event. Purchase order (bon de commande) - to be sent by April 24 at the latest. In order to receive a refund, cancellation requests must be in writing and sent by May 6th which will cause a €25 processing fee. No refunds will be issued on requests postmarked after May 6th. In recent years, there has been a move away from long scary disclaimers of liability for acts of God, terrorism, strikes, volcano eruption etc., so these are no longer included. A reception is being arranged for all the conference participants on Wednesday evening May 29 starting at 19:00. All conference attendees are invited to this reception as a chance to meet and renew relationships with colleagues. Music and food will be provided free of charge. The Graduate Student Award ceremony will be held at the beginning of the social event. By car: Nice is connected to all the great European cities by a major motorway network. In particular, the A8 motorway, 'La Provençale', running from Aix-en-Provence to the West to the Italian border on the East. 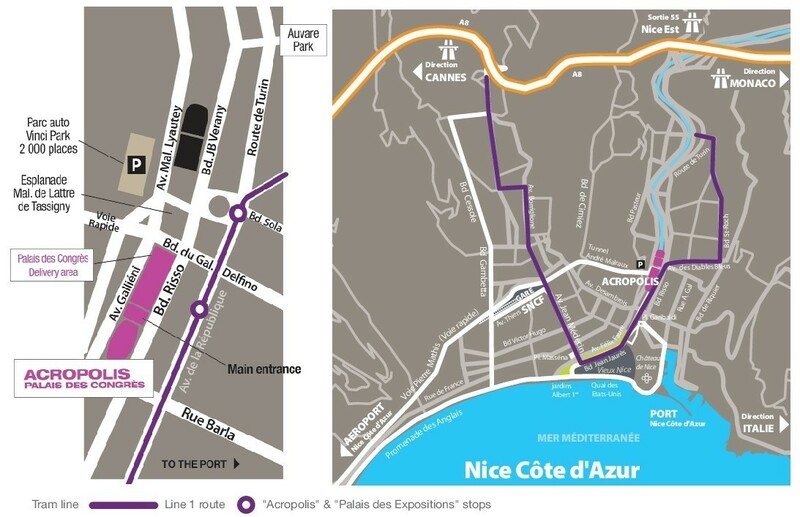 From the A8 motorway, take the exit n ° 50 "Promenade des Anglais", and join the Nice Acropolis Convention Center via the "Way Pierre Mathis". Follow the sign « Acropolis ». The train station is 5 minutes from the city center. Take the tramway towards « Hôpital Pasteur »; Stop at « Acropolis ». The Nice Airport is an international gateway just 10 minutes from the city centre. The Nice Côte d'Azur Airport is the second largest in France with 13,3 million passengers travelling through each year, 111 direct-flight destinations and 61 scheduled airlines. It is also the first airport outside Paris to offer a daily connection to New-York and Dubai and the leading provincial low-cost airport, with 3 million passengers a year and 18 airlines. Connection from the airport: take Bus n°98 to the station « Cathédrale Vieille-Ville »; then take the tramway towards « Hôpital Pasteur »; stop at « Acropolis ». Attractive discounts, up to -15%, on a wide range of public fares on all Air FRANCE, KLM and their code-shared flights worldwide**. Coffee will be served during the morning and afternoon breaks mainly in the exhibition hall. Please check the individual technical conference listings for exact times.